(Nanowerk News) Researchers of Aalto University in Finland and the German University of Marburg have collaborated in the study of the movement of charges over interfaces of semiconductor materials. The group noticed a new kind of transport phenomenon for charges. In the phenomenon, a pair formed by a negative electron and a positive charge moves onto an interface, after which its 'message' is passed on to the other side of the interface, where it is carried on by a similar pair. The new theoretical result opens up interesting prospects for carrying out logical operations in electronics. - In addition to microelectronics, transport phenomena of charges are in a key role in many biological processes, such as photosynthesis, explains Professor Ilkka Tittonen from Aalto University. In the tunnelling phenomenon a particle can, with certain likelihood, penetrate the thin interface between materials, even if it would be seen as impossible according to classical physics. The newly discovered phenomenon is not based on the tunnelling of individual charges, but rather on the dynamics of a pair made of an electron and a positive charge that is connected to it electrically. This bound pair composed of an electron and a positively charged hole is called an exciton. "The observation is quite unique. Finally, an optical pulse functioning on a terahertz frequency brings information or the so-called correlation of the electron hole pair from one side of the interface to the other, without any tunnelling of the exciton itself. No phenomenon that would be fully equivalent to this has been found previously in the field of modern physics," Tittonen explains. The phenomenon combines semiconductor and terahertz techniques and it allows a new kind of logical operation in microelectronics. The group believes that it will be possible, on the basis of the phenomenon, to design new kinds of processors which function partly through optics and partly through electricity. 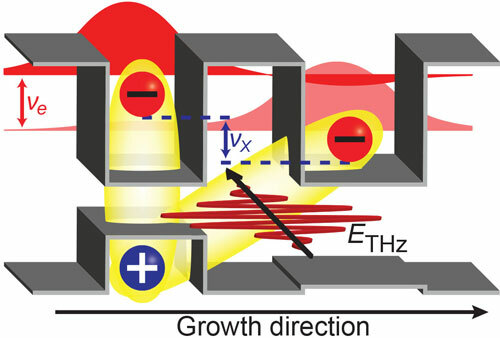 The group published its observations in the publication Physical Review Letters ("Coherent Terahertz Control of Vertical Transport in Semiconductor Heterostructures"). The study took place at Aalto University School of Electrical Engineering in Finland, primarily by Osmo Vänskä, under the supervision of Professor Ilkka Tittonen and Professors Mackillo Kira and Stephan Koch. Finnish funding for the study has come from Aalto University and the Academy of Finland. Professor Mackillo Kira serves as a visiting professor at Aalto University regularly every year.